Love it all!!! The perfect casual glam Holiday look! Oh how festive and chic darling! What?! You made that faux fur vest?? That's SO amazing and talented!! 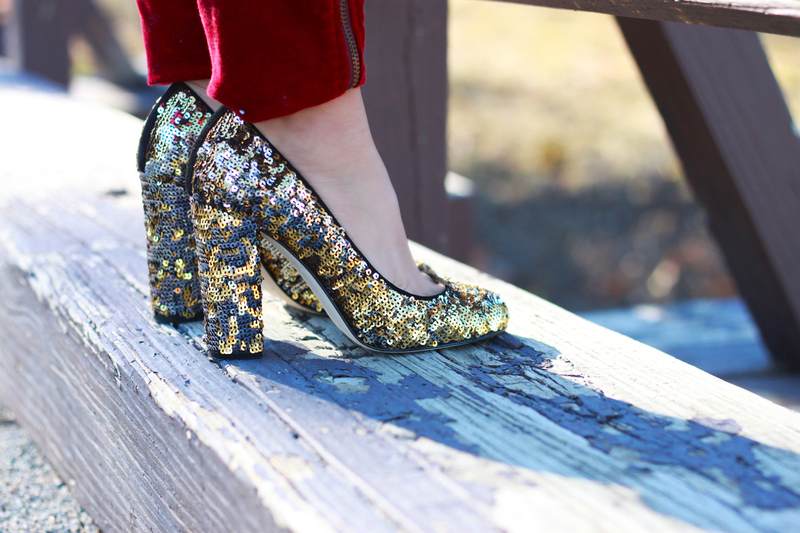 Love the glittery heels, they're perfect for the holiday festivities! Your shoes and pants were enough, but the sweater and your DIY vest make this outfit so amazing!! We love it! I'm dying over the heels- and I love the rest of the outfit too! Such a fun way to wear sequin pumps without also putting on a cocktail dress!! Love! So cute! This is such a pretty and perfect holiday attire, the sweater is so sweet! ADORABLE!!!! Such a great casual holiday outfit!! I'm loving the gilet and shoes! i love the look, so adorable. This is such a lovely holiday outfit! Loving the faux fur, glitz and animal motifs! Love all the pretty pieces in this outfit! Swoon! Love this look! The shores are fabulous!